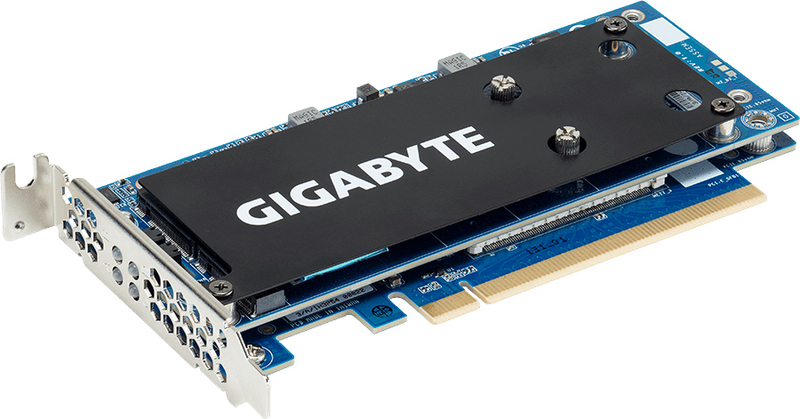 GIGABYTE B2B has launched two PCIe riser cards for M.2 SSDs designed to build ultra-fast storage sub-systems consisting of multiple M.2 drives. The CMT4030-series risers will be available through B2B channels, hence, to makers of servers, workstations, and high-end PCs rather than to DIY enthusiasts. Neither of the GIGABYTE CMT4030-series cards use any PCIe switches and therefore rely on PCIe bifurcation supported by CPU or PCH (i.e., they will not work on cheap systems that have limited PCIe bifurcation capabilities) as well as on software RAID technologies supported by the platform. Both risers support M.2-2280 and M.2-22110 drives, they are equipped with their own thermal sensors and advanced VRMs to ensure quality power supply to SSDs. GIGABYTE’s CMT4032 is a low-profile PCIe 3.0 x8 riser card that supports two M.2 drives and comes with an aluminum heat spreader. This card may be used inside higher-end consumer systems to build high-performance storage systems featuring two SSDs as well as a 6.5 GB/s throughput. The CMT4034 low-profile PCIe 3.0 x16 riser card carries four M.2 drives on two PCBs that also has a passive cooling system. This riser is officially aimed only at GIGABYTE’s Purley generation servers, so their work on systems based on other Intel platforms (X299, X370, etc.) is not guaranteed. As for performance, maximum throughput supported by a PCIe 3.0 x16 slot is around 15.75 GB/s. Pricing of GIGABYTE’s CMT4032 and CMT4034 SSDs risers is unknown, but since we are dealing with B2B products, it will vary depending on volumes and negotiations. The manufacturer plans to offer its 4-way Aorus PCIe x16 M.2 SSD riser for high-end desktops at some point in the future, but details are unclear. The last 7 or 8 mITX boards I've owned, from Gigabyte, Asus or ASRock have all not recognized any TV-tuner or soundcard I've tested, but have accepted every GPU. Why would you want to couple a very expensive PLX-equipped quad M.2 array with an old system? For that matter, outside of video editing... who even needs these?? They are basically only good for a crapton of sequential performance, which by itself isn't very helpful for most workloads. Worse yet I've seen these boards cause performance regression... and it's amplified if the board (like these cheap ones) rely on software RAID.